What you can do with eBooks? Can put your name as the author. Can be used as web or e-zine content. Can be added into membership sites. Can be sold in any format. Can be given away (in any format). Can be sold on auction sites. Can offer (Master) Resell Rights. Can resell Private Label Rights. 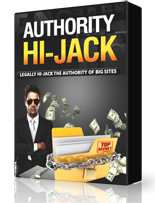 Legally Hi-Jack The Authority of Big-Name Sites And Get People to trust your content and keep buying your services! Get #1 Rankings for your videos using the SEO strategies shared inside this course. Guaranteed results in 7 days or less - so you can enjoy organic traffic and clients on autopilot! More than 850MB of visit cards, banners, flyers, Twitter backgrounds, Facebook tabs, Youtube Channels, logos - fully editable in PSD format. Niches covered: Attorney, Book Store, Coffee, Dentist, Dog service, Chiropractor, Ice Cream, Pizza Plumbing, Real Estate, Rent Car.